Use Natural microscopic living organisms to boost your plant and garden’s health and fertility! Spray on plants, flowers, fruits & soil and the microbes will do the rest. They will find their way to different parts of the plants and soil, figure out what is needed to help the plants at the right time and get it done. 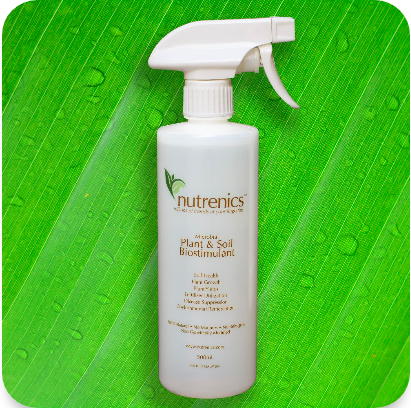 Nutrenics Plant & Soil Biostimulant is a collection of more than 15 different types of natural microscopic organisms (microbes) beneficial to plant and soil health. The microbes work together with plants on a wide variety of functions critical to the plants health. These microbes have been selected based on their beneficial activities to the soil in promoting healthy soil activity by breaking down toxins into more bioavailable compounds, suppressing disease causing microbes & providing nutrients for plants. Beneficial microbial activity in soil is critical for plant health and growth. Healthy soil contains trillions of microbes which perform a wide variety of tasks creating an ecosystem which is symbiotic with plants, providing them with essential nutrients. 100% Natural. No Manures. No Pathogens. Non-genetically Modified. Spray lightly and evenly on plant leaves, stem, flowers, fruits & soil every 3-4 weeks.